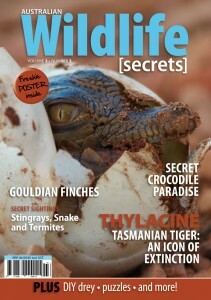 This issue contains some fascinating insights into the life of the Freshwater Crocodile – featured on the cover – and some of our amazing lizards. We have also set up a new page called ‘Secret shutterbugs’ for those who love to delve into photographing the world of wildlife and want even more tips on getting the best shots. In an exclusive, our story about the sad and tragic world of the icon for extinction, the Thylacine or Tasmanian tiger, provides some amazing insights as well as images not published before. We’ve also got a packed ‘Secrets sightings’ with interesting and unusual tales, including ones about termites, the Rough-scaled Snake and, of course, birds and more birds. If that is not enough, let us take you inside the world of the endangered Gouldian Finch.